The ambiance of Perry’s is very relaxed with the bar area, Bar 79, being more casual and packed with a happy hour crowd. Turns out they have great “social hour” pricing on their appetizers in the bar area and usually have live music. We were seated at a crescent shaped teal colored booth in the main dining area and greeted by our server, Mary-Ashley. We were offered three options for water and some bread to snack on as we looked over the menu. We tried two different salads, a Wedge Salad with iceberg lettuce topped with red onions, green onions, tomatoes, bacon and a buttermilk vinaigrette dressing and their new Kale Salad featuring kale, pecorino cheese and croutons served with jalapeno mint vinaigrette dressing. Both salads were refreshingly crisp and perfectly portioned. We were especially surprised at how flavorful the Kale Salad was! The highlight of the meal! We ordered the 6 oz. Filet Perry - topped with jumbo lump crabmeat, herb-garlic butter and served with steamed asparagus. It’s an exceptional cut of meat, so we ordered it medium-rare. It was cooked to perfection and the flavor was set off by the crabmeat and garlic butter. Normally we order our steaks medium, but medium-rare turned out to be a great choice. Perry’s Famous Pork Chop. This cured, roasted, slow-smoked and caramelized hunk of meaty deliciousness, is served with a ramekin of homemade applesauce. This pork dish looks like something that would give Adam Richman, of Man vs. Food fame, pause! It’s “Seven Fingers” high and is cut into three sections by the server once it arrives at your table. The first section consists of three ribs. The meat on these ribs falls off the bone with ease. The next portion is called the “eyelash” and is a section of marbled pork that is bursting with flavor! If and only if you make it through the first two sections, you come to the Tenderloin or “eye” of the dish. This is a massive serving of pork (2”x4”x4”) that is meant to be dipped in the apple sauce. It is incredible!!! Prepare to loosen your belt a notch or two if you decide to try and finish it off in one sitting. 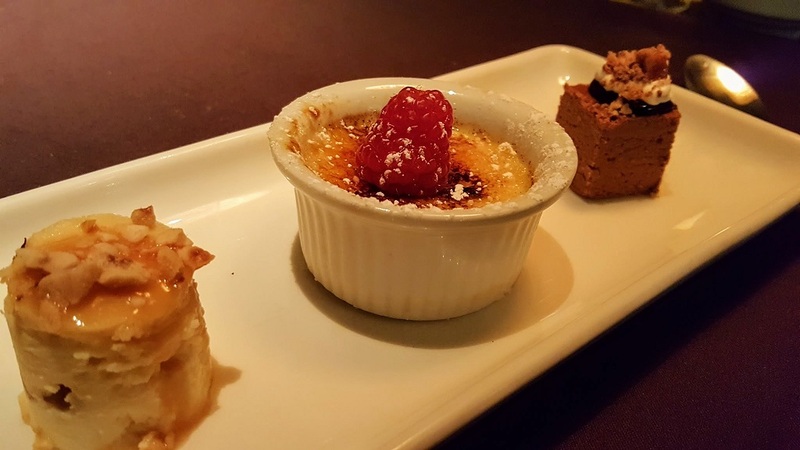 Somehow we made it to the Dessert Trio, a vanilla bean crème brûlée, chocolate crunch, and praline cheesecake. After the entree we were happy to see that these three items were served sample-size. Each item was about three bites and were all delicious in their own way! 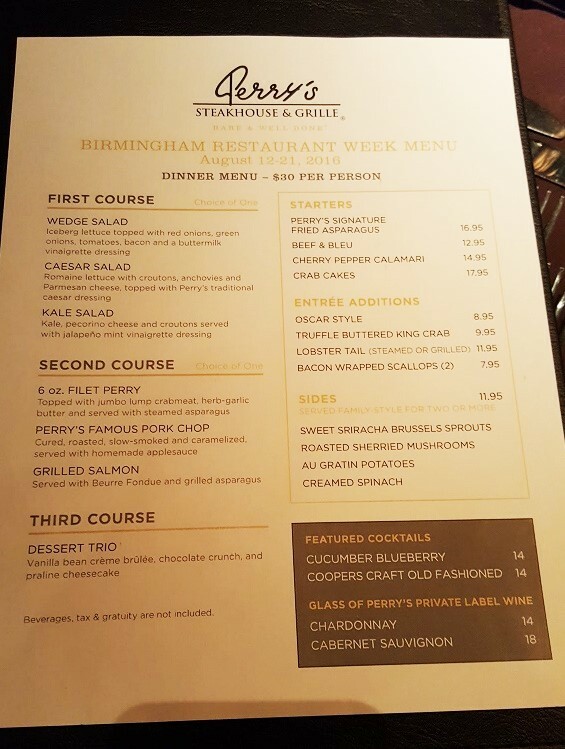 All in all, Perry’s was a wonderful dining experience that is a perfect fit for Birmingham Restaurant Week! We plan to go back, but will be splitting the Famous Pork Chop. We’re betting we will still have some left to take home with us.